We’ve been open for nearly six months already, how the time has flown by, so we felt it was time to take a look at the menu and make a few improvements. We’ll be taking you through our thought process and introducing some new items this week, starting today with our new savoury bakery options. If we had a pound for every time we have been asked for a ‘cheese scone’ we’d now have about £50. We aren’t going to be offering cheese scones or scones full stop, not now…not ever. We are however listening to your feedback and have been racking our brain for some time to come up with the right addition to feed your savoury cravings. Recipe books have been well thumbed and keyboards tapped in the search for the answer; we know you love our freshly baked goods – cinnamon buns are our best sellers, it has to be sufficiently Scandinavian to fit with the rest of the menu and I (Paul) find savoury cakes/muffins deeply offensive so they’re out. So the answer: pretzels. Pretzels are a staple across Northern Europe and the familiar shape can be seen hanging above bakery doors and across windows in several countries. At Baltzersen’s we work hard to make sure we do things right, but we aren’t afraid to ask for a bit of help when we need to create something great. Enter Wayne Caddy, professional baker for over 25 years, Head of Baking at the School of Artisan Food and artisan bakery consultant. 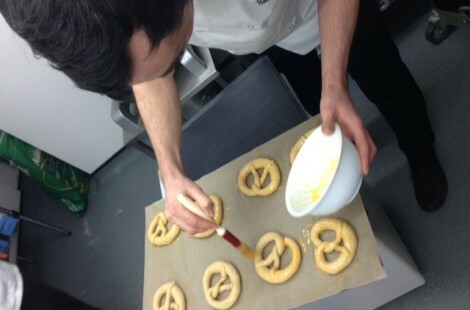 Wayne joined us for a one day masterclass with a brief that included the development of savoury pretzels. Eggwashing the shaped pretzels. We chose to eggwash rather than dip them in caustic soda, because caustic soda is a pretty nasty substance to be around. Safety first, taste a close second! 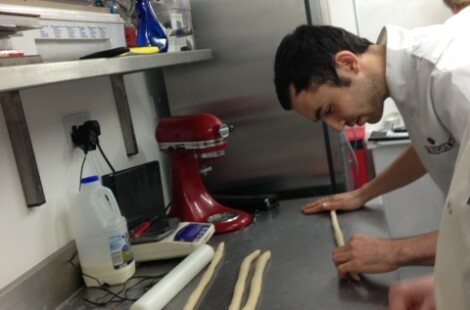 A number of flavours were tried including cheese, chilli, cracked black pepper, fennel and tarragon. 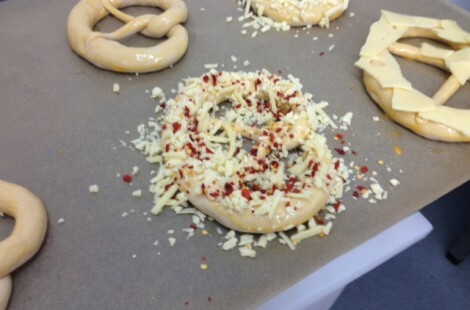 The cheese and chilli option ready for the oven. 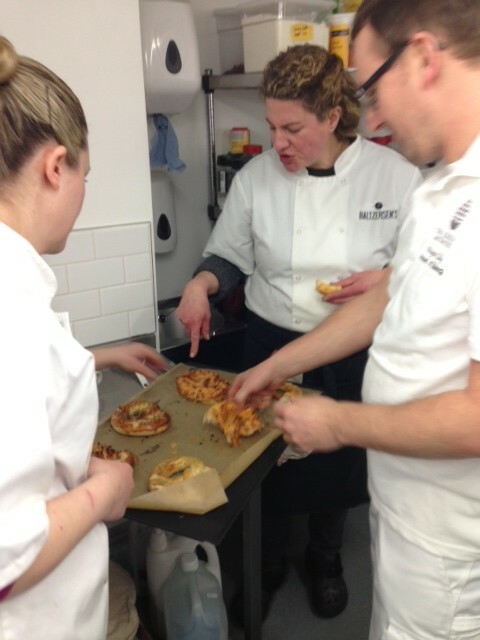 The best part; tasting warm from the oven and discussing the results. 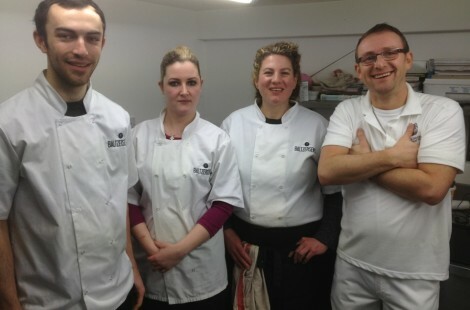 The team were really happy with the results in terms of taste and confident of being able to consistently repeat the process they had learned. 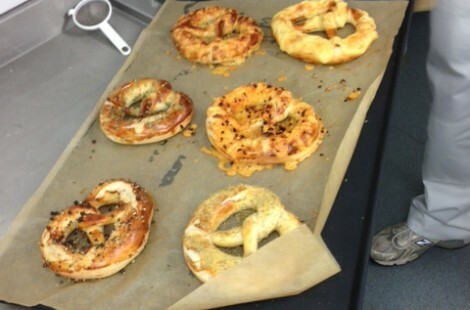 You, the lucky customer, can look forward to sampling a savoury pretzel over the next few weekends as we gradually introduce them to the menu.